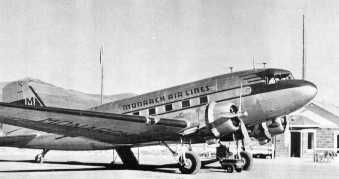 Monarch, based in Denver, started scheduled air service on November 27, 1946 with a flight from Denver to Durango, Colorado using a DC3. It was formed by F.W. 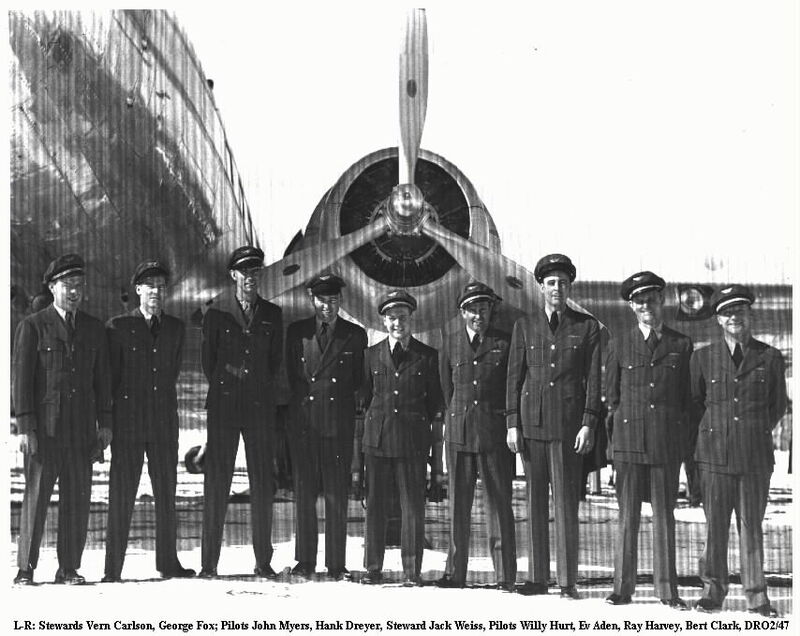 Bonfils of the DENVER POST family and Ray M. Wilson, who operated a Denver flying school. 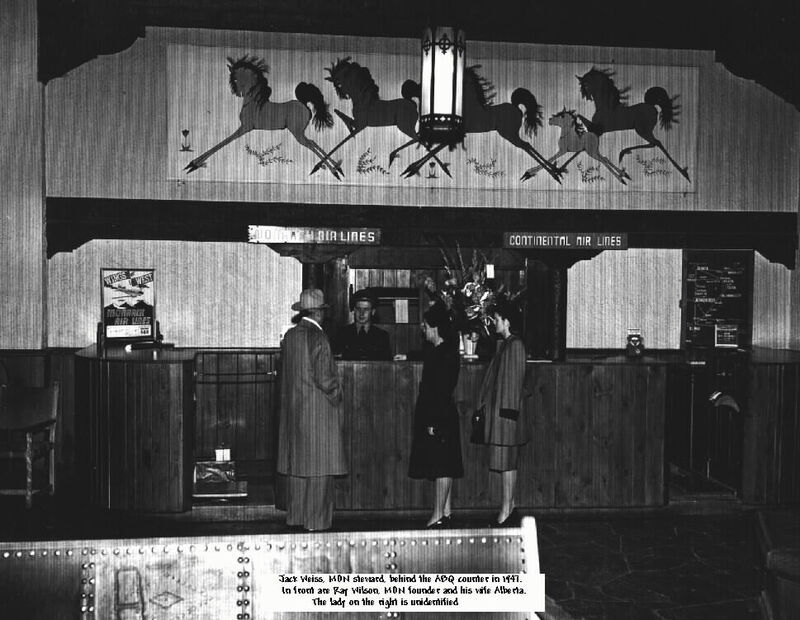 Other services started to Albuquerque, Salt Lake City and Grand Junction. 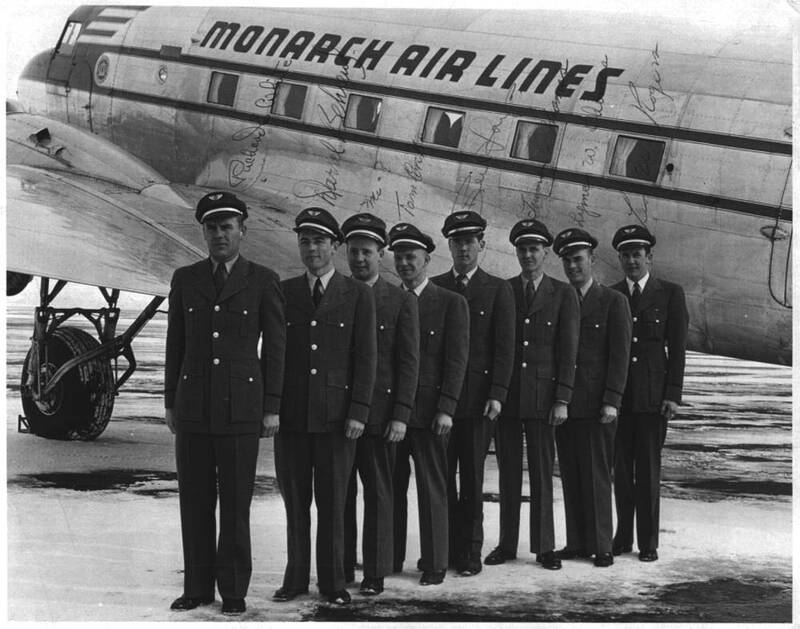 Monarch pioneered all weather operations in their service area by installing its own navigational system. 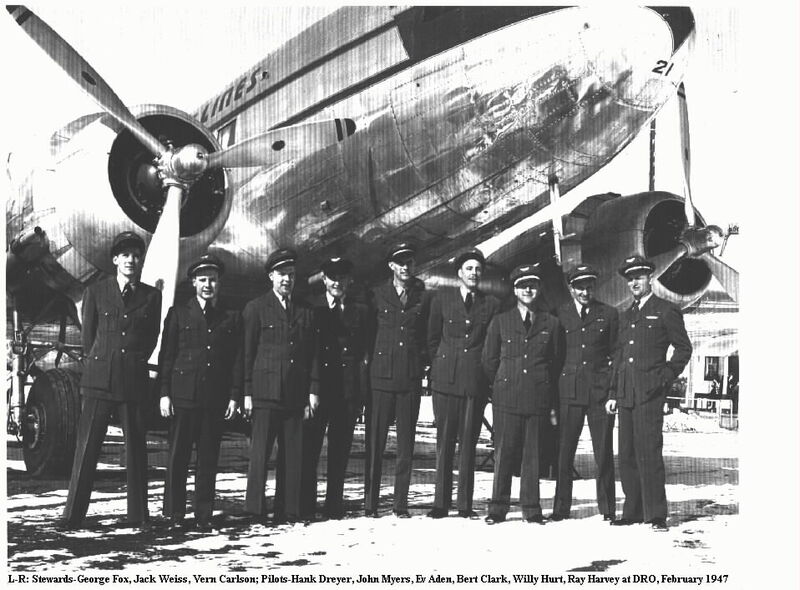 By 1948 the airline was sharing several functions with Challenger Airlines such as maintenance and sales at Denver. 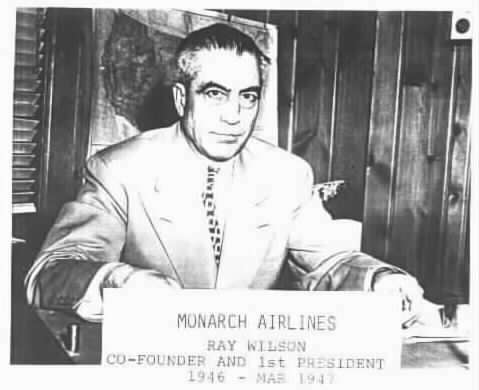 Then Monarch bought controlling interest in Challenger in December, 1949. 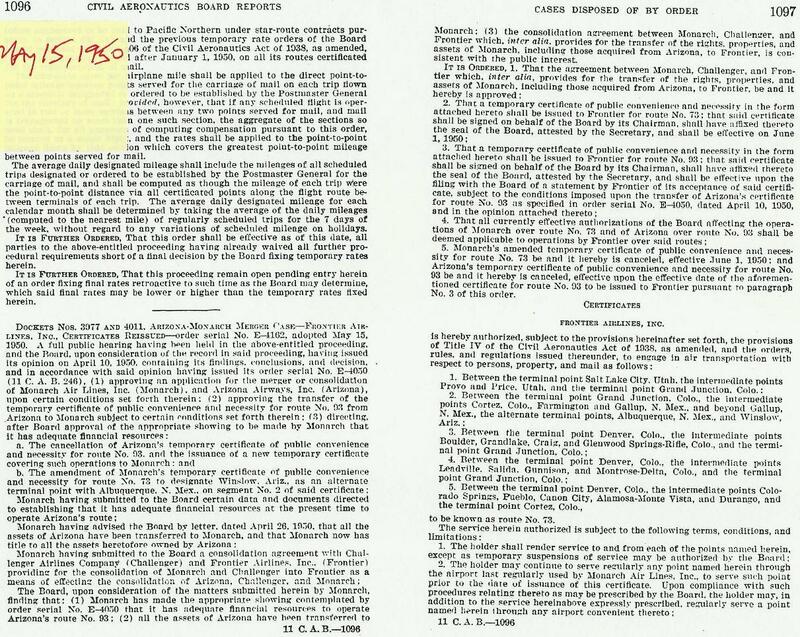 The CAB approved the merger with Arizona Airways on April 10, 1950 which took effect June 1, 1950. 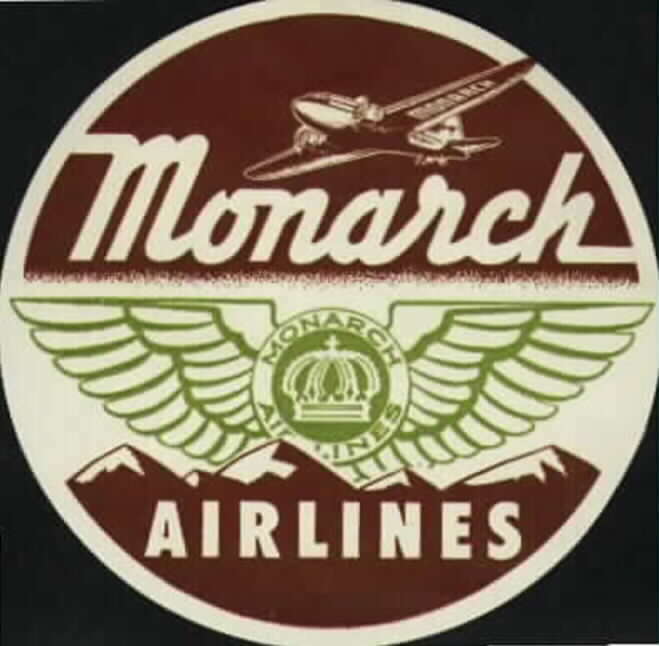 Monarch merged with Arizona Airways and Challenger Airlines on June 1, 1950 to form Frontier Airlines. 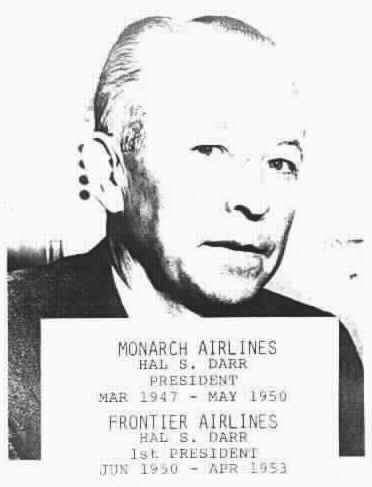 Monarch's President, Hal S. Darr, became President of the new airline. Ray Wilson became V.P. 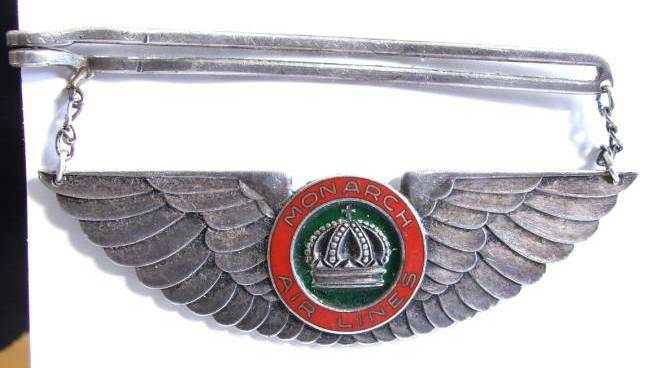 Operations and Maintenance of the new company and Monarch's Treasurer, C.A. Myhre, became Executive Vice President and later President of Frontier. 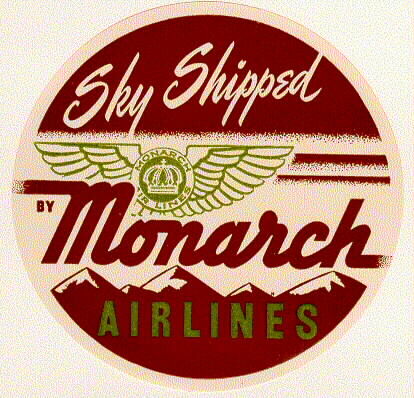 Monarch had five DC3s at the merger: NC64421, NC64422, NC64423, NC64424, and NC66610. They became Frontier Sunliners Arizona, New Mexico, Royal Gorge, Mesa Verde and Utah. 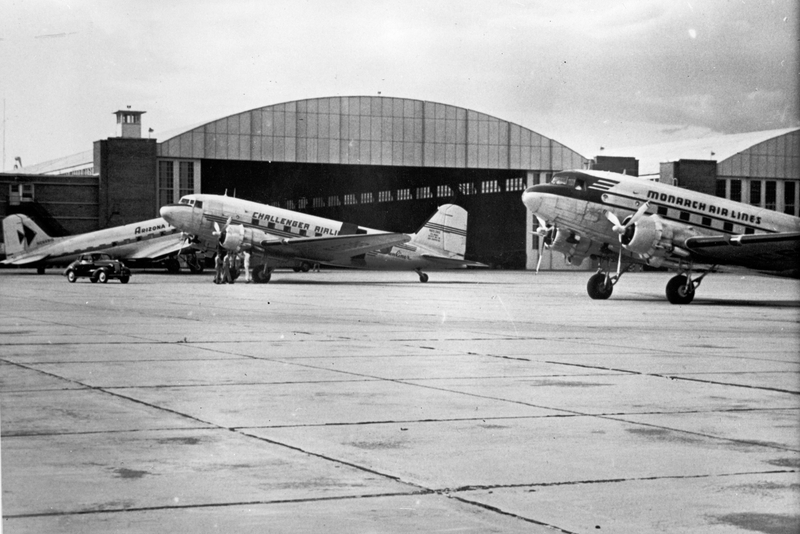 This is the only known photo of the three airlines' aircraft. 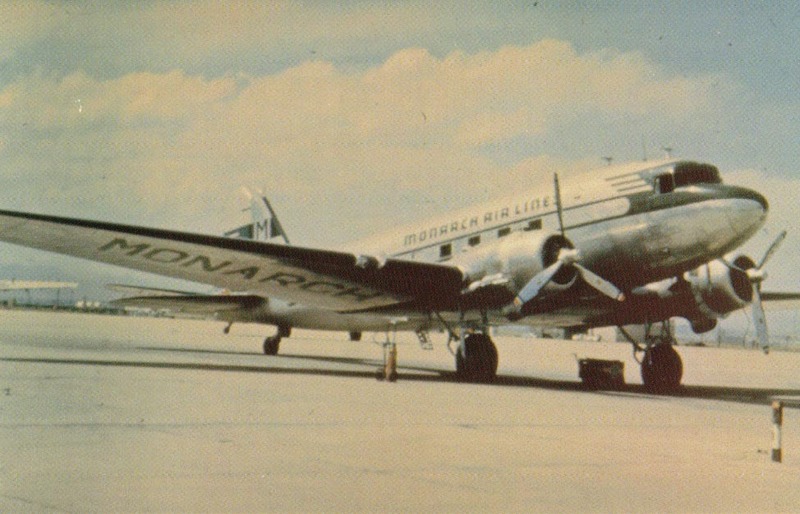 Monarch DC3 sitting on ramp. 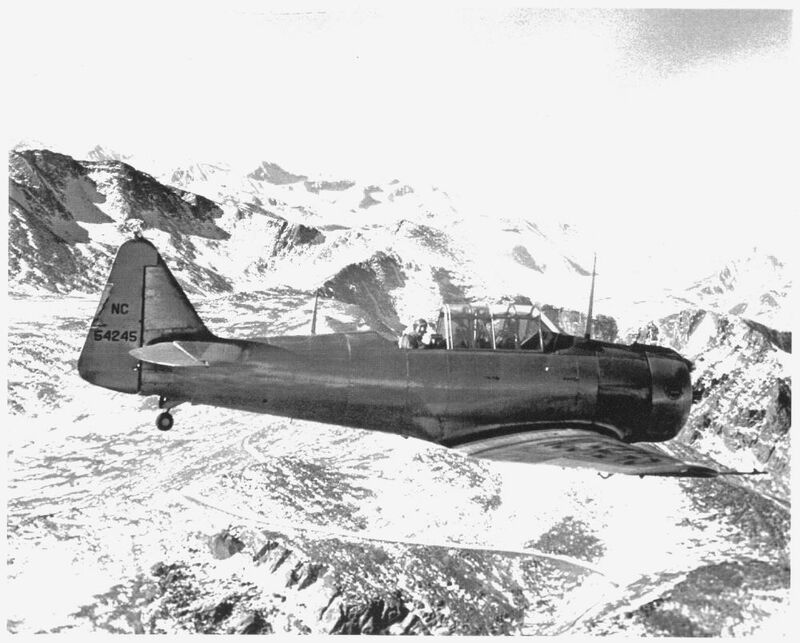 This North American AT-6 was used for captain route qualification purposes. 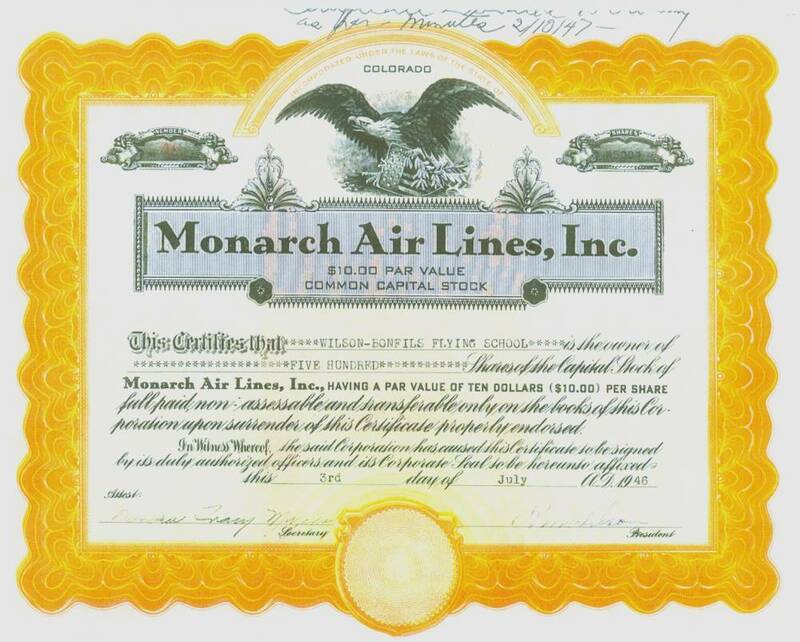 It was used when I first came with Monarch Air Lines in 1948. ...(in the back seat, of course) since that is where the flight instructors sat. as well as the Aerial Photographer for the Denver Post Newspaper. between Saguache and Tomichi Dome approaching Gunnison Colorado. 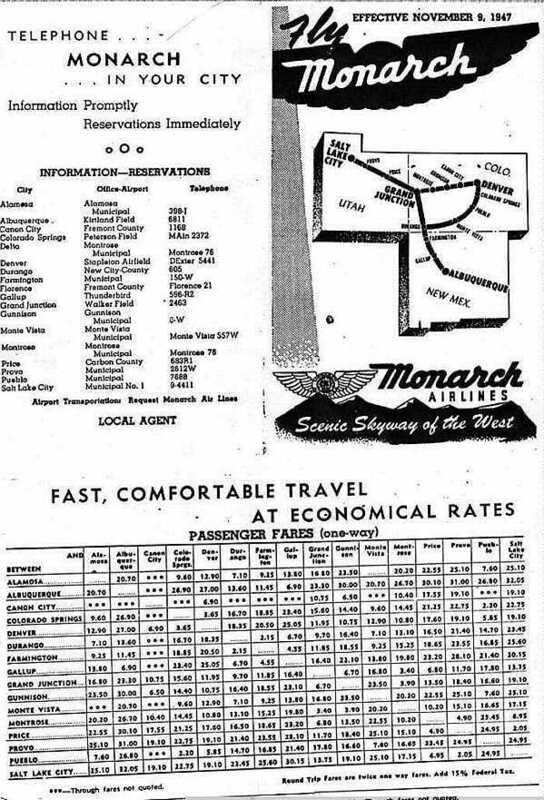 Ad with fares, phone numbers, and route map from November, 1947.
and Challengers Airlines June 1, 1950 to form Frontier Airlines. Darr became the first President of Frontier. Thanks to Craig Hansen for his graphic work which includes the nameplate and the DC-3 header.